Questa spaziosa struttura dispone di circa 133m² ed è arredato e attrezzato. Si trova nel 5 ° Piano ed è molto silenzioso e luminoso nonostante la posizione centrale. Ci sono 3 camere disponibili in tutte le 3 camere da letto c'è un letto matrimoniale. Nel soggiorno è anche un divano letto. Inoltre, ci sono 2 bagni con vasca, cucina e 2 servizi igienici separati. Si trova proprio nel centro di Vienna. L'Opera di Stato, Piazza Santo Stefano, il municipio e tutte le attrazioni della città storica sono raggiungibili a piedi in pochi minuti. Perfect location. Very noisy with street cars and traffic. Hot in July with no A/C so had to leave windows open at night. Clean and bright. Well equipped unit. We enjoyed the location, and size, and cleanliness, however, there were some issues. First, I would bring up the issue of security. There is one questionable lock on the main door, and several times it was open. The door to the apartment had one lock, very basic, and 2 deadbolt slides that didn't work! We were told it was safe, but it begs the question why there were deadbolts to begin with! Every apartment we've had has had 1 working deadbolt. We jury rigged a coat rack with umbrellas to fall over if someone were to try to enter when we were there. Also, The building is only partially residential, the others being offices for various businesses. Next, there is minimum bedding one base sheet, one duvet, and one 12x18 pillow. There are 3 couch pillows. Our daughters were sick, and i asked for some extra bedding so we could wash the ones we had. They explained it was 7 Euros per set, and no extra pillow or duvet! When our daughter got sick in the bathroom there were no supplies to clean it up! No paper towels no Lysol disinfectant, they explained that was for the cleaning service! We were supposed to leave it on the walls and floors for 3 days and let them clean it really? It's short money to have a bottle of cleaning supplies! Lastly there is no closet or place to store clothes in the master bedroom save a small 2 drawer dresser, with drawers that stick. Clearly my biggest concern is safety, and i would suggest that they get at least one deadbolt working! Do not expect anything but less then the basics for amenities, and if you stay during winter, bring some extra blankets! Extremely comfortable & right in the heart of the old town. Our stay could not have been better. The apartment is just a short walk from the major attractions in the old part of town. The place was very clean and exceptionally comfortable. 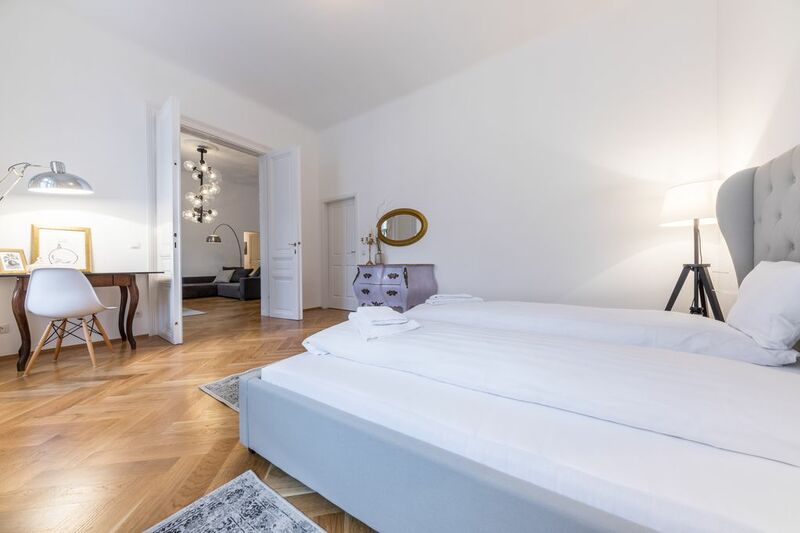 L'appartamento si trova nel centro di Vienna. L'Opera di Stato, il Municipio, Piazza di Santo Stefano e tutte le attrazioni della città storica sono raggiungibili a piedi in pochi minuti. In aggiunta, ristoranti, bar e negozi per le necessità quotidiane nel quartiere. La posizione centrale del collegamento alla rete di trasporto pubblico è eccellente: metropolitana, tram e autobus si trovano nelle vicinanze.